Hugh Grant stated that it is the best film he have ever done. Anachronisms: The road markings at the junction outside the George Inn in Norton St Philip are modern; dashed double white lines were not around in the 1950s. Miss Kenton: Look at it! Is that or is it not the wrong chinaman? Miss Kenton: Mr. Stevens, look at that chinaman and tell me the truth! Stevens: Miss Kenton, I would ask you to keep your voice down. What would the other servants think to hear us shouting at the top of our voices about... chinamen? Miss Kenton: And I would ask you, Mr. Stevens, to turn around and look at the chinaman. Wow, what a wonderful movie this turned out to be! I didn't check this movie out until the fall of 2004 after reading a number of positive reviews, enough to pique my curiosity. I was glad I did. In fact, I was so impressed with this film that a week later I went out and bought the book, which is even better. First of all, the film is a tremendous visual treat. There are some great interior scenes of the Darlington mansion, and great colors inside and in the surrounding outside scenery. This is simply a beautiful film. 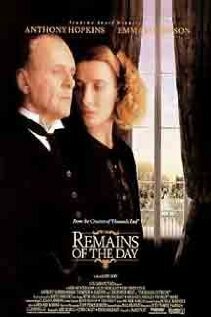 Second, the acting of Anthony Hopkins and Emma Thompson was spectacular. They were riveting. The way they deliver dialog and the expressions of their faces.....magnificent acting. Thompson's sad look in the back of the bus near the end of the movie is the saddest, most haunting look on a person's face I have ever seen in 50 years of movie watching. Hopkins, one of the best actors of this generation, provides a tremendous character study of a man who has been taught that to be the best in his profession, he must suppress all emotion. In doing so, he never learns to think for himself and he misses out on what could have been the love of his life. In that regards, this is a very frustrating story. However, this isn't just a tragic romantic story. Hopkins' character is wonderful example, too, of unselfish devotion and dignified servitude in the face of any kind of circumstance. This is an extremely beautiful, intelligent and sensitive film. If when people tell you, "They don't make 'em like they used to," show them this film.